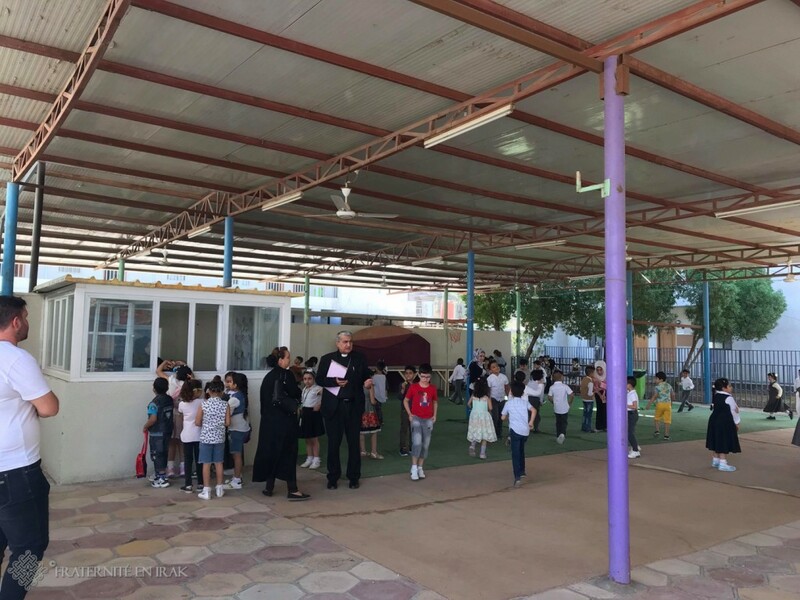 Since 2017, Fraternity in Iraq has been involved in the extension of the multi-confessional school in Basra. In September 2018, the school welcomed new primary school pupils. A big white cat with silky hair has been drawn and Strawberry Charlotte, the heroine of a cartoon for children, has been painted on the walls of the classroom. Below those colorful murals, small desks line up. Pupils sit there and are already very concentrated. 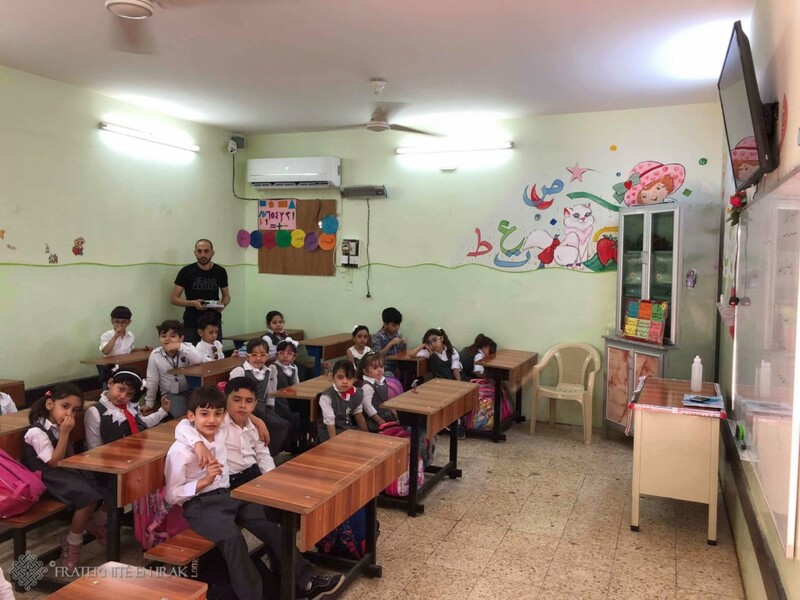 Since the 30th of September, children of the Chaldean school in Basra, southern Iraq and the second largest city in the country, have come back to work in a refurbished and enlarged school. The institution, called School of the Annunciation, stands out by its multi-confessionalist feature. Whether they are Shiites, Sunnis or Mandaeans, many parents enroll their children in this deemed school, which degree is higher than the average in the region. The openness that prevails there contributes greatly to its success among all communities. Thanks to your donations to Fraternity in Iraq, premises have been extended. 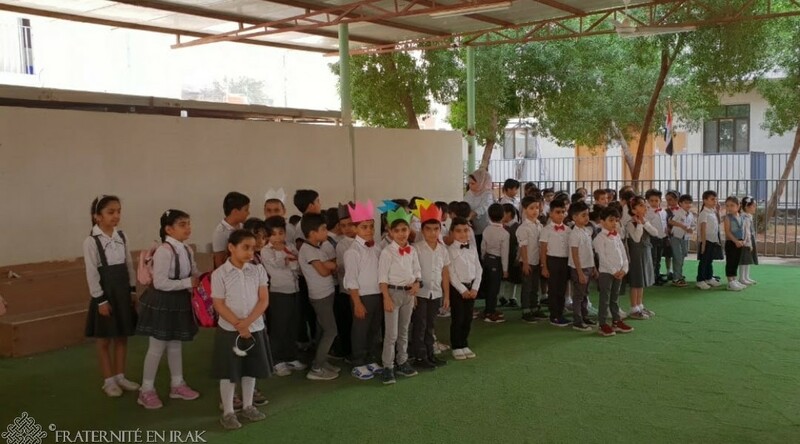 Kindergarten already welcomed 120 children; henceforth, since 2018, four additional classrooms and a building housing a primary school have come out of the ground. Pupils, who are very concentrated, are receiving their material for the year on the first day of school! There are laboratories, a computer room, offices, and the accommodation of the director … Forward, the new primary school would be expected to accommodate 200 pupils. However today, only 60 children, from CE1 to CM2, work and run in its corridors. No more because of shortage of money. « To teach properly, the school needs $ 600 (about € 520) per year and per child, » claims Bishop Habib, the Chaldean bishop of Basra. As a result, he regrets that « we are currently unable to do our work without asking for an additional $ 200 (175 €) contribution to pupils’ parents ». The school, held by nuns, employs 30 employees, including 7 teachers, an accountant and 2 cleaners. Bishop Habib in the schoolyard on the first day of school. Needs remain important because it is necessary to buy bottles of water for the children and the staff – since summer 2018, the area of Basra has suffered of shortage of drinking water- photocopiers, school books, Internet subscription and student uniforms, to maintain air conditioning and CCTV system and to adjust electricity… The situation is serious but the school of Basra doesn’t feel down. This is the required price for it to continue playing a bridge role between communities and to promote access to education and cohesion among all.